Graduate recruitment is becoming an increasingly daunting job. All stakeholders seem to be frustrated for a reason or another. Recruiters face a huge pressure to deal with the recruitment backlogs with little success. The recruiters’ complaint is twofold. First, there is a common belief among human resource professionals that graduates lack the necessary skills despite the undeniable academic achievement. Second, talent acquisition costs are ever-increasing, either because of the hiring of wrong candidates, or because difficulty of spotting the right talents among the flood of CVs received after every job posting. Traditional screening, or key word search doesn’t seem to satisfy the screening needs when every job candidate understands the game. Indeed, all these factors transform recruitment into a highly intuitive and risky game. On the other hand, graduates are not satisfied with the recruitment process. In many occasions they don’t understand what is being measured and how, neither feel that they could demonstrate their competencies adequately. No one seems to understand what the young graduates are looking for. And that point is particularly frustrating! More importantly, line managers are increasingly less impressed by the long-term performance of their graduate recruits. Despite impressive CVs and solid academic achievement, they seem to lack some critical ingredients, such as leadership, and engagement. Even qualified candidates don’t stay long enough to become leaders. 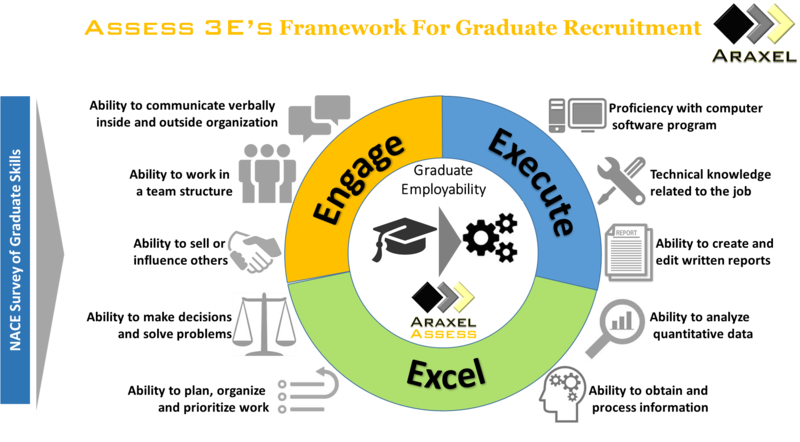 We have designed the 3 E’s framework for graduate recruitment: Engage, Execute & Excel. The 3 E’s framework is based on a recent survey by the National Association of Colleges & Employers, which has identified the most sought graduate competencies by employers. The good news is that all these competencies are measurable, and can be reliably assessed using the right talent measurement systems. More interestingly, our research has shown that using assessment along with traditional interviewing, a necessity for behavioral and personality aspects, effectively contribute to an improvement of the employer brand, and satisfaction among all stakeholders regarding the recruitment process transparency and objectivity.